Here’s what we’re up to: I’m going to turn on the camera and microphone and just hang out on Zoom. I’ll answer any questions you have. Or if you just want to chat about cloud services or your offering, I’m happy to talk about that. Any member who shows up between 11 AM and Noon (Pacific) is welcome to join us. You can come with an agenda or without. 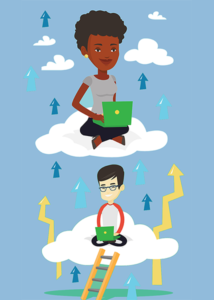 I just want to make myself available to all members.Of course I hope some of you will be working your way through Cloud Services in a Month – so I’m happy to talk about the book, the philosophy, the handout, etc. Other than the general topic of “Cloud,” I’m not setting any limits on what we discuss. You’ll need to register on Zoom. The password is on that page. Strictly limited to Members Only. If you want to attend, you need to be a member. Note: These meetings are NOT going to be recorded. If you want to be part of the Hang, you need to show up live.If this works, we’ll do more stuff like this. One of the most important things you can do for your company is to Weed Your Client Garden from time to time. 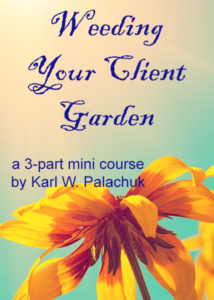 Just like a real garden, you need to trim your client base from time to time. This seems very counter-intuitive to many people. But you have to get rid of clients who cannot grow with your company, as well as those who are difficult to work with, unprofitable, or don’t fit your culture. In this three-part mini class, we’ll look at several scenarios for growing your business by “weeding” out some of your clients. This weeding is not random. It’s not brutal. And you absolutely will not lose money. Some people hear my advice on this strategy and think I’m getting rid of clients you “need” to survive. Just the opposite is true. I’ll show you how to find those clients who are costing you money, wasting your time, and holding you back. We’ll walk through the math of cutting out clients as well as various strategies for growth. Weeding your client garden is ALL ABOUT growing your business and making more money. Here’s a good one. This is a Word doc you can customize for your business. This five-page checklist guarantees that your clients are brought into your system right every time. That means you set them up in the PSA, RMM, QuickBooks, etc. with all the correct information. Then you verify that all monitoring and AV software is installed, all monitoring is working properly, etc. This list is intended to follow a logical progression from sales to front office to service delivery. And it finished with client-facing training by a customer service rep or technician. It’s also a great example of how checklists help you to make sure you don’t skip any steps, and you do them in the right order. One of the key pieces of your client relationship building is to make sure it starts off in a consistent manner. Word docx file you can customize. Just posted a new document you can customize for your clients. This is a Word doc memo you can customize to welcome new clients to your services. Of course you can edit out the “managed services” component.The goals here are to set the tone for your new relationship and introduce the client to your ticketing system. Basically, you want to give them the information they need to have success in the tech support relationship. 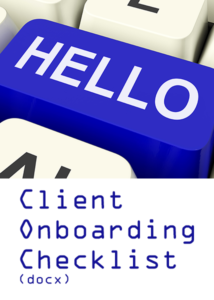 I revised and updated the New Client Onboarding Checklist for the recent class on Client Onboarding. So I’ve also separated that out and posted it as stand-alone content in the Community. 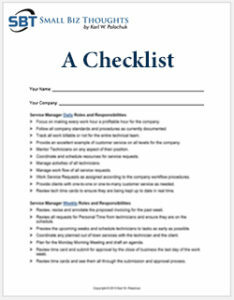 This Checklist has a “cover sheet” describing what you sold the client (managed services, cloud services, add-ons, etc.). Then it is used to make sure the tech department delivers everything that was sold, all the billing is taken care of, and the client is trained on your new service. Delivered at a Word DOCX so you can customize as needed.